How can everyone be creative ? People may think that creative people are rarely found and there are only a few well accomplished artists, scientists, and business people. That high level of creativity could be obtained by birth or developed through purposeful and diligent practice over the years. Dr. James C. Kaufman and Dr. Ronald Beghetto called the latter type of creativity the Big-C level creativity (Kaufman & Sternberg, 2010). I want to make a point that everyone can be creative, whether you want to improve your daily work capacity, build up leadership, or tackle daily problems more gracefully. Creativity does have a process, but the process is not linear, so it may feel chaotic when you first practice it. For today’s article, we will explore the original model of the creative process proposed by Graham in his work Art of Thought in 1926. In order to help everyone memorize and recall the process, I summarized them into PIET: Prepare, Incubate, Eureka, and Test. PIET-Creative Process is created based on Graham (1926) and Jessica S (2014). This is one of the most critical and time consuming stages. Albert Einstein emphasized the importance of understanding the problem and suggested that if he was only given 60 minutes to solve a problem, he would generously spend 55 minutes to find the right questions to ask, and then solve the problem in less than 5 minute. We can’t verify what exactly he said, but at least we get the point. So the key questions to complete this step is how to ask good questions to define the problem. Pohlmann & Thomas (2015) categorized four types of questions: adjoining, elevating, clarifying, and funneling. We will explore good-question techniques in another article. Distraction is actually a good thing during this stage. Once we have defined the problem to certain extend, the brain hands the creative work to the subconscious brain. Do you ever wonder how you managed to pull off that last minute writing assignment one hour before the deadline back in college? Yup, thanks to your procrastination and maybe some exciting social parties, you are carving out time and space for the subconscious brain to do the work. However, as we venture into daily leadership roles, we find that college-type of procrastination is more harmful than productive. It is because that professors have already done the hard work helping us defining the scope of the problem and handing to us the right questions to ask. Harmful procrastination also is related to stress and anxiety (Fiore,2007; Ariely & Wertenbroch,2002). I will be exploring ways to strategically procrastinate in future articles. In the original model consisted of two stages “intimation” and “illumination.” Wallas (1926) defined “intimation” as getting a “feeling” that the solution is on its way and “illumination” where creative ideas flushing into the conscious awareness. I decided to combine the two stages together like Jessica did because it is difficult to determine when the solution is on the way or not until the conscious mind knows about it. Besides, if we tell ourselves to deliberately seek the “feeling,” it could impose pressure onto the creative process and become counterproductive. Wallas (1926) suggested this stage as “verification” where creative ideas are consciously verified, elaborated, and then applied. If the creative idea passes the test of reality, then the process is completed. However, if the idea fails the test (most likely), then a new creative thinking process restarts. 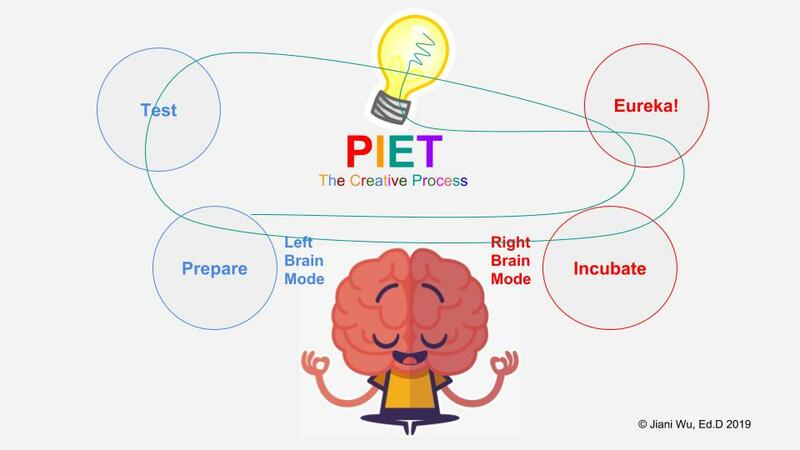 So next time, when you are admiring the creative people, try to practice the PIET creative process and get your own creative juice flowing. Next, I will be exploring “creativity & strategic procrastination,” “the art of good questions,” “creativity & fears,” “creativity and happiness,” “creativity and mindfulness”and “how to enhance creativity.” If you want to suggest some topics of creativity, please feel free to leave in the comment below. P.S. I had plenty of fun creating the cover photo. What is your creative project? Ariely, D., & Wertenbroch, K. (2002). Procrastination, deadlines, and performance: Self- control by precommitment. Psychological science, 13(3), 219-224. Kaufman, J. C., & Sternberg, R. J. (Eds.). (2010). The Cambridge handbook of creativity. Cambridge University Press. Pohlmann, T., & Thomas, N. M. (2015). Relearning the Art of Asking Questions. Harvard Business Review. Wallas, G. (1926). The art of thought.